After meeting and getting engaged in Brooklyn, NY, Johnpaul and Ashleigh (founders of Pew People) headed south to the amazing city of Louisville, KY. 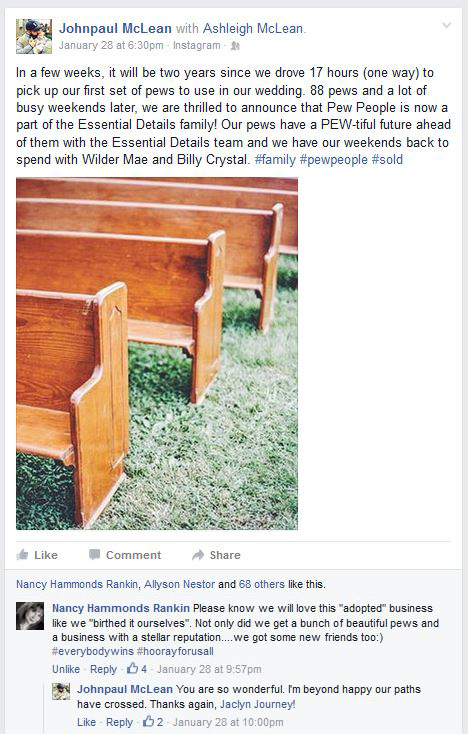 When it came time to start planning their wedding, they had a lot of ideas about how they wanted that day to look - and something they were certain they wanted were vintage church pews for their outdoor wedding ceremony. After searching far and wide for pews to rent, they were discouraged to find that nobody in the area had any - until now! What started with 16 pews has grown to 100 pews and allows seating for 500+ people! In 2016, with a darling baby stealing the spotlight, Johnpaul and Ashleigh decided that the next step for Pew People was to sell it to a company who could grow it and who had the same affinity for making wedding days magical, just as they did. With this decision, Essential Details took the reins, and while under new ownership, Pew People is running as smoothly as ever and we are excited to continue offering our pew collection and related decor for weddings and events! These PUN loving Pew People are here to make your wedding dreams come PEW!